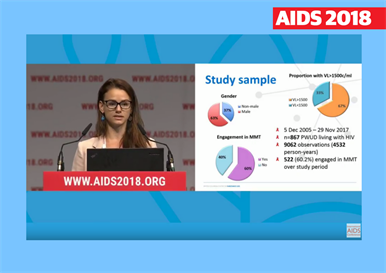 Image from the webcast of Brittany Barker presenting at AIDS 2018. People on methadone maintenance treatment spent less time with a detectable viral load above 1500 copies/ml, potentially reducing the risk of HIV transmission, a study presented at last month’s 22nd International AIDS Conference (AIDS 2018) has found. Methadone is an opioid substitution treatment prescribed to minimise the harms associated with the use of heroin or other opioids. Methadone maintenance treatment also promotes improved adherence to antiretroviral treatment and retention in care in people living with HIV who use drugs. Buprenorphine, an alternative to methadone, is widely prescribed in France and North America. Although the use of methadone maintenance treatment is known to reduce the incidence of HIV in people who use drugs by reducing the frequency of injecting, it is not known whether, by influencing adherence and care-seeking behaviour, methadone maintenance treatment has an impact on virological control. To answer this question, researchers from the British Columbia Centre on Substance Use looked at the relationship between the time spent accessing methadone maintenance treatment through low-threshold facilities – those that make it as easy as possible for drug users to obtain methadone – and the time spent with a viral load above 1500 copies/ml. Having a viral load above 1500 copies/ml is associated with an increased risk of HIV transmission to sexual partners. The viral load threshold at which the risk of HIV transmission through shared injecting equipment increases is not known, so the level of 1500 copies/ml used in this study is an assumption. The study population was drawn from a British Columbia cohort, the AIDS Care Cohort to Evaluate Access to Survival Services (ACCESS), of people living with HIV who use illicit drugs. All participants in the cohort study taking antiretroviral therapy were eligible for inclusion in this analysis if they had at least two viral load measurements. Viral load was routinely sampled every six months. These measurements were linked to antiretroviral prescription dispensing records and to self-reports of methadone uptake. The study population comprised 867 people who used drugs in care between 2005 and 2017. The study accumulated 4532 person-years of follow-up; during this period 60% of participants received methadone maintenance treatment for at least some of the time. Sixty-three per cent of the study population was male. During the study period, 67% of the sample had at least one period of viral load over 1500 copies/ml and on average, spent 19% of the observation time with a viral load above 1500 copies/ml. Engagement in methadone maintenance therapy was independently associated with a reduced risk of time spent with a viral load above 1500 copies/ml: people who received methadone were 30% less likely to have a viral load above 1500 copies/ml at any point during the study period (adjusted hazard 0.70, 95% CI 0.60-0.81, p < 0.001). Presenting the findings, Brittany Barker, a PhD candidate at the University of British Columbia, said that methadone maintenance treatment is a key intervention for reducing onward HIV transmission in the community and that the group’s findings support the scale-up of evidence-based addiction care, including the reduction of barriers to methadone or buprenorphine prescribing by non-specialist physicians. Barker B et al. Engagement in methadone maintenance therapy associated with less time with plasma HIV-1 RNA viral load above 1500 copies/mL among a cohort of HIV-positive people who use drugs in Vancouver, Canada. 22nd International AIDS Conference, Amsterdam, abstract WEAX0101LB, 2018. View the webcast of this session on YouTube.